Finally I have had enough of the unreliability of the Blueface service! My new phone number is +353-21-490 8485. This is the Eircom number on my DSL service. I may go to another provider in time but for now, at least I know the Eircom service works. Just as a matter of documenting the failings of my Blueface VOIP service, I am unable to make outgoing calls on my Blueface service again this morning. Oh hang on, no I’m not! This morning I was unable to receive incoming calls on my Blueface service. I discovered this when Brian Greene tried to call me. Fortunately we were having an IM chat on Skype at the time so we were able to talk on Skype instead but had it not been for that, I would have been blissfully unaware that there was any problem. Yet again my Blueface VOIP telephony provider won’t let me make outgoing calls. This really is a crap ‘service’. GrandCentral is an offering from the original creators of DialPad, which gives you one phone number for all your telecommunications. One Number…for LifeTM – Pick a number that will not change when you move or change jobs. ListenInTM on Voicemail – ListenIn on your messages from any phone before answering. Screen Your Calls – Know who is calling every time, even for blocked numbers. RingShareTM – Upload your MP3s to play for your callers instead of the standard ring. Block Callers – Block telemarketers or annoying callers and never get bothered again. Switch phones mid-call – Switch from cell to office or home your callers won’t know. Customize by Caller – Pick phones to ring, greetings to play and music to hear based on who is calling. Voicemail Everywhere – Get your voicemail online, through the phone or in your email. Voicemail Storage – All of your voicemail messages will be saved online, for LIFE. When will it be available in Ireland? Blueface has me blue in the face. 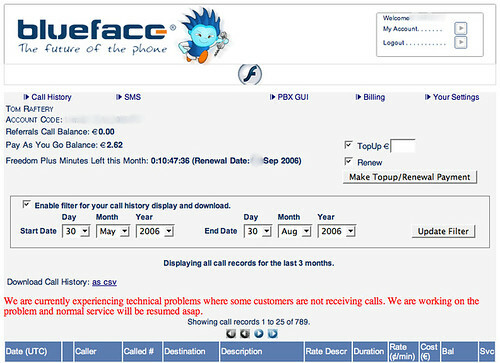 I have written before about what a crap service I am receiving from voip telephony provider Blueface. Now I know why they are called Blueface. Yet again today the Blueface service is down and I can’t make outgoing calls from my landline. And anyone who has called me on my mobile knows just how bad mobile reception is here. It will be difficult to extract myself from Blueface now, as the contact number I have given everyone is the number Blueface have given me. For anyone considering using their service – don’t. Use any other telephony provider, even Eircom! Really. I switched my telephony over to VOIP earlier this year. I signed up for an account with Irish VOIP co. Blueface and the service has been, on the whole, fairly reliable. In fact, I was so happy with the service I recommended it in a Sunday Times article on VOIP this last weekend. Boy do I feel stupid now – the VOIP service has been down for over 12 hours now leaving me with no phone service for incoming or outgoing calls (apart from my mobile). For now, if you need to call me, call me to my mobile (+353 86 384 0828). Update: Phone service has returned to normal after nearly 24 hours and no explanation of the downtime. I have an account with Blueface – Blueface is a VOIP provider. For â‚¬19.99 per month I am supposed to get 1,000 minutes of calls to over 20 countries. All good, so far. The only issue is that for some bloody reason, at the end of every month my credit is deleted and I can no longer make outgoing calls. Two problems here, in the first place, I should be able to carry the unused minutes I have paid for over into the next month and second, since I have signed a direct debit form, the money should go out of my account, pay for the next month and there should be no interruption to my service. Come on guys, get with the program or lose a customer. Fast. can you switch off the modem and ATA for 30 secs and then switch them back on and leave them for 5 mins. if it still doesn’t work thrn let me know. everything is connected fine and your ATA is registered on our server. Of course that tells me nothing. I tried turning both the router and ATA off several times today and that didn’t fix it then – why was this time different?